The only thing weak about this book is the cover, I mean, come on; I’d have probably passed this book by, based on the cover. 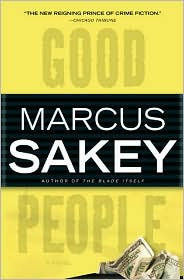 Lucky for me, I’m already a fan of Sakey’s and have been looking forward to his next book. His books are always set in Chicago, this is his third, and they just keep getting better. When you pick it up, be prepared to read all day. Good People is full of action, suspense, and realistic characters; cops, robbers, good people and bad people; lots of bad people. The plot is very involved and I’m not giving anything away, trust me, just dive in.